Whether your project calls for round or square columns, Valor Specialty Products Inc. offers fiberglass columns to match your needs. Combined with numerous cap and base options, fiberglass columns can meet your exact project requirements. They are a perfect touch to any project, be it residential or commercial. 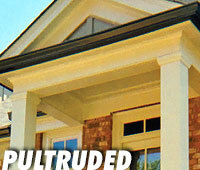 The load-bearing strength of fiberglass columns makes them as practical as they are beautiful. Since they are crafted with such style and grace, their functionality tends to fade in light of the sophistication and class they lend to any home or structure. Designed to enhance your home or business with style, elegance, and years of virtually maintenance free service, while avoiding typical environmental decay such as rotting, splitting, or warping. Valor's Square and Round Fiberglass Columns are manufactured using a pultrusion process that results in a lightweight, yet very strong and durable load bearing product with the look and feel of natural stone. Fiberglass columns come ready to be painted in any way your project dictates, and are already primed for a perfect finish.